Children learn a great deal from other people, including history, science and religion, as well as language itself. Although our informants are usually well-intentioned, they can be wrong, and sometimes people deceive deliberately. As soon as children can learn from what others tell them, they need to be able to evaluate the likely truth of such testimony. 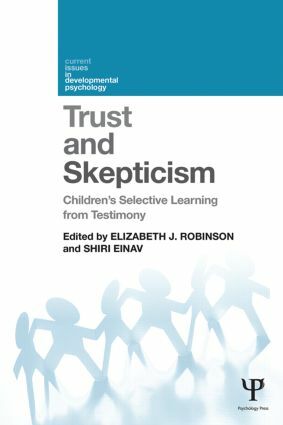 This book is the first of its kind to provide an overview of the field of testimony research, summarizing and discussing the latest findings into how children make such evaluations – when do they trust what people tell them, and when are they skeptical? The nine chapters are organized according to the extent to which testimony is necessary for children to learn the matter in question – from cases where children are entirely dependent on the testimony of others, to cases where testimony is merely a convenient way of learning. Chapters also consider situations where reliance on testimony can lead a child astray, and the need for children to learn to be vigilant to deception, to ask questions appropriately, and to evaluate what they are told. With an international range of contributors, and two concluding commentaries which integrate the findings within a broader perspective of research on child development, the book provides a thorough overview of this emerging sub-field. Trust and Skepticism will be essential reading for researchers, academic teachers and advanced students working in the areas of cognitive development and language development, and will also be of great interest to educationists concerned with nursery and primary education. Elizabeth J. Robinson is Emeritus Professor of Psychology at the University of Warwick, UK. As well as her main research interests in developmental aspects of the transfer of knowledge between people, she has a related side interest in communication in medical settings. Shiri Einav is a Lecturer in Psychology at the University of Nottingham, UK. Her research focuses on children’s developing knowledge attribution, evaluation of oral and printed sources of information, and selective learning.